The Government of Guyana cannot provide a paper trail accounting for the negotiations it had with oil giant ExxonMobil on the issuance of US$18M that has been dubbed a signing bonus. This is because all exchanges between the government and the oil company were done verbally. This information was revealed recently when Chairman of the Parliamentary Sectoral Committee on Natural Resources, Odinga Lumumba, questioned Minister Raphael Trotman. Lumumba’s first question to Trotman on the issue of “signing bonus” was whether the coalition government employed a specific equation to arrive at US$18M or if it was a case where Trotman simply placed his “hand in a bag” and drew a figure. Trotman totally ignored the bit about randomly picking a number. He sought to explain that the government was guided by history. 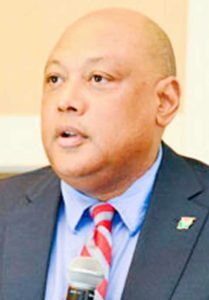 Trotman said that the coalition government had benefitted from some advice that in July of 2000 when CGX attempted to explore towards the northeastern side of Guyana, boats from neighbouring Suriname arrested the drillship and stopped the work that the oil company was doing in that area. Trotman’s utterances suggested he was not the government official who set the figure. He told the Committee, “With the benefit of that advice, it was my understanding that the figure was given as a fair figure that would cover expenses in the International Court of Justice (ICJ)”. Trotman said that US$15M was earmarked for Guyana’s representation before the ICJ and the remaining US$3M was intended to be used for capacity building. It was here that Lumumba asked about the paper trail. “You know how large companies work; they have regulations to operate by in America and they have to make declarations. I assume there is a letter somewhere from Exxon to the government saying we’re granting the US$18M for this purpose,” Lumumba asserted. Trotman was keen to note that there was no intention to siphon the money. He said, “It was US18M, not a cent more, not a cent less. No government or no minister who wants to steal money will ask the Bank of Guyana Governor, who no one knows to be on any list of the APNU or AFC or a supporter of the government, to hold the money for them. No one would ask for the bank to be the keeper of the fund, they would put it someplace else. Trotman said that there was a specific reason government kept everything about the signing bonus ‘hush-hush’. He said that it wanted to “catch Venezuela off guard”.